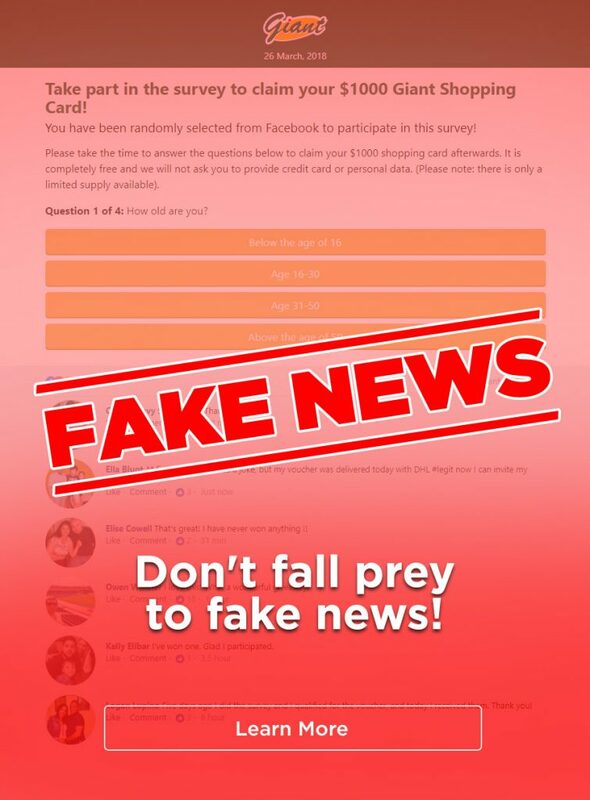 We have noticed that there are many recent false surveys or giveaways circulating on the Internet and in messaging apps, promising promotions, offers or vouchers in Giant Singapore’s name. We would like to clarify that these activities may not be initiated by Giant Singapore. Any other channels that claim to represent Giant are deemed to be unofficial and unauthorised unless officially acknowledged by Giant via its website or official channels of communication. To ensure that your personal data is not compromised, do not click on suspicious links, especially links that are not shared by Giant’s official channels. If you are unsure whether an information shared is true or false, always contact our customer care centre for clarifications. Ensure you always use a secure website when you need to enter confidential or personal information. To be absolutely sure you are using a secure web server, check that the address in your browser begins with “https://” and not with “http://”. A small padlock should also appear somewhere close to the address. If you have identified a fake news, do spread the word to your friends so they are aware of them. If you see your friends spreading such news, do give them a friendly warning that they are likely to be false.